Interview with Alexander Markovsky, head of SPOK - the regional nature conservation organization in Karelia. Protect the Forest, Sweden: When IKEA and Swedwood are criticized for their logging of forests with high conservation values in Russian Karelia, they often respond with lies. At Protect the Forest we find this arrogant both towards their customers and towards everyone who wants to protect the last old-growth forests in northwestern Europe. Indeed, IKEA and Swedwood keep insisting that their forestry has the support of the concerned parties in Russia, and that the forests they log do not have high conservation values according to Russian standards. So to clarify this matter, Protect the Forest has interviewed Karelia's foremost expert in forest conservation, Alexander Markovsky. He is the chairman of the regional environmental organization SPOK, and holds a Ph. D. in forest ecology. Protect the Forest, Sweden: Greetings, Alexander Markovsky! Protect the Forest would like to ask you some questions in connection to our campaign against IKEA's logging of old-growth forest in Russian Karelia. On their websites and in interviews, IKEA/Swedwood have said that they do not cut down forests with high conservation values. They say that these forests are, in a Russian context, comparable to managed forests in Sweden and that they do not have high conservation values. To begin with, we would like to ask you: Are IKEA/Swedwood logging forests which Russian experts have classified as having high conservation values, for example intact tracts of natural forest? Alexander Markovsky: Yes, IKEA/Swedwood carries out some cuttings within intact tracts of natural forest. We have seen this in the autumn of 2011. The problem is that much of the leased area of IKEA/Swedwood in Karelia consists of intact tracts of natural forest. Protect the Forest, Sweden: IKEA/Swedwood also claim that enough forest in Russian Karelia has already been protected, and that in the area leased by Swedwood, the survival of biodiversity has already been secured with no need for further protection. In an interview published in the Swedish newspaper Smålandsposten IKEA says that "In Karelia, around 56% of the forest has some sort of legal protection." How much of the forest in Karelia has a strict legal protection in practice? Alexander Markovsky: In Karelia, all types of felling is prohibited (strict legal protection in practice) on an area of 418 000 hectares, which is 2.3% of the territory of Karelia. Protect the Forest, Sweden: IKEA/Swedwood say in interviews that they do not log trees as old as 500-600 years, and have never done so. They say that after years of field studies, only one ancient tree has been found. This 430-year-old pine (an admittedly venerable age) is alleged to stand in an area they have set aside for voluntary protection. When we met you in northwestern Karelia, where Protect the Forest examined Swedwood's ongoing logging, I know that you personally counted the annual rings of a pine that turned out to be around 520 years old. Can you confirm that Protect the Forest is correct to say that IKEA/Swedwood log forests with pines aged 200-600 years? Alexander Markovsky: When you and I were on IKEA/Swedwood’s logging sites we saw fresh stumps from 500 years old trees. In our office we now have a piece cut from a tree stump which was more than 350 years old, which we brought from one of IKEA/Swedwood’s logging sites. Protect the Forest, Sweden: Anders Hildeman, forest manager at IKEA, has made the following response to the letters of protest (Swedish version): "It is the presence of single old trees or single tree stumps that determines the natural value [of the forest]." This is hopefully a misprint! But IKEA has in several statements in the media said that there are a few stumps in most of the ancient natural forests that they cut down. This is some sort of ridiculous attempt to reduce the value of forests and lie about the forests primacy. So IKEA seems to be of the opinion that old-growth forests with occasional human-made stumps are not worthy of conservation. Representatives of Protect the Forest saw a range of Swedwood's logging of old-growth forest, from forests that had no such stumps that we could see, to forests with occasional stumps. But all these were from single trees that had been felled, and the forests still had high conservation values as a whole, with no traces of modern forestry. The forests which are labeled old-growth or ”primeval” forest in Sweden by both forestry, government, and environmental organizations often have a few human-made stumps from older times, but the ecological dynamics and the structure still warrants the label "primeval". Examples are Hamra national park, Norra Kvill national park, and Muddus national park, and these are similar to the forests which are now being clear-cut by IKEA/Swedwood. Rather than confessing to clear-cutting ancient natural forests with centuries-old trees, IKEA and Swedwood are trying to shift the discussion to the definition of the term "old-growth forest" and ”primeval forest” and whether such forests can contain occasional human-made stumps. What is your view on this? Alexander Markovsky: Old-growth or primary forest areas in the north of Europe are quite small. And at the same time practically all areas of intact forests in the European taiga contain traces of human activities (trails, hunting huts, occasional human-made stumps). It is very rare to find areas of primeval forest that have been completely free from human activity. The important thing is that in old-growth forests, there are no traces of industrial logging. In these kinds of forest there have been no changes to the dynamics of the natural forests with relevance to the conservation of biodiversity. These forests do not need fertilizers, thinning, and other human support. Individual stumps can occur in old-growth forests, as traces of the traditional life of local people. Protect the Forest, Sweden: In the Swedish media, IKEA/Swedwood are saying that there is no need for further protection in the areas they lease. Protect the Forest and many conservation scientists with us say that all intact areas of ancient natural forest must be protected in Fennoscandia, because such areas are so rare overall. We need these forests in order to preserve biodiversity, to sequester carbon (which is released into the atmosphere upon clear-cutting), to obey the precautionary principle, and to preserve the ecosystem services we all depend on. A living forest landscape is also a means of subsistence for the local population, with hunting and fishing, tourism, berry- and mushroom-picking, firewood, use of wood for building, etc. Also, on a larger scale, in areas with a higher proportion of natural forest it is easier to preserve the ecological dynamics of a forest ecosystem. We note the similarity between IKEA/Swedwood's arguments and the proposal of the Karelian government to cut two thirds of the areas planned for forest protection. Protect the Forest suspects this is no coincidence. Since SPOK is the main Karelian organization for forest conservation, how do you view this? Is the forest area set aside for long-term protection in northwestern Karelia enough? Alexander Markovsky: No, in the current situation there is not enough of protected forests in Karelia. There are 147 protected areas of different kinds of habitats (forests, mires, lakes, rivers etc) covering a total of 0,9 million hectares (5% of the territory of Karelia). In 2007 in Karelia a master plan was adopted for the establishment of new protected areas. According to the plan, 60 new protected areas should have been established until the year 2025. The amount of protected areas was to be increased by 1.8 million hectares. This would mean that a total of 15%, or 2,7 million hectares, would have some sort of protection. This concerns the whole territory of Karelia, including other habitats than forests. However, in the autumn of 2011, the Government of Karelia tried to reduce the number of planned protected areas down to 20 units, covering only 0,1 million hectares. But in 2012, these plans have been revised and are now once again up to the level of creating 57 new protected areas by 2030 on a total planned area of about 1.8 million hectares. Protect the Forest, Sweden: In the media, IKEA/Swedwood claims that the company has set aside 17% of their leased area for conservation purposes. But Protect the Forest has examined their (rather cryptic) maps, and it seems that much of the 17% is required under Russian law; this includes buffer zones beside lakes and streams. In other areas, the demarcations are so vague and unclear that it is difficult to understand what is protected and what isn't. Does SPOK - Karelia think it is reasonable for a forest company to claim that buffer zones beside lakes, streams and wetlands are voluntary protection, or is that just compliance with Russian law? Alexander Markovsky: Prohibition or restrictions on logging near rivers and lakes are strict requirements of the Russian legislation and not voluntary. The strictness depends on the length of the river, the size of the lake, the availability of spawning grounds of valuable fish in the pond, etc. Does SPOK think it is reasonable to claim that 17% of an area is protected without being able to show where these areas are and how long-term the protection is? Alexander Markovsky: Any environmentally responsible company should have available maps which clearly and understandably shows the territory which is preserved, why and for how long. Protect the Forest, Sweden: In their reply to the letter of protest, IKEA/Swedwood have portrayed themselves as saviors, supplying the local population with jobs and firewood through their generosity. We think this is a rather colonial view. How many of the local population have jobs through IKEA/Swedwood? How much is that compared to the jobs lost in local companies which existed before Swedwood leased the forest? How long-term are the local Swedwood jobs? It does actually take 600 years for forests with 600-year-old trees to regrow. We have met locals in Karelia who say the opposite of what IKEA/Swedwood claim: their local companies have been out-competed, IKEA/Swedwood are not keeping their promises, and some factory workers have been treated badly. Also, Swedwood is known for their conflicts with unions in for example the US. People in Karelia used wood before Swedwood arrived on the scene. It's cynical of IKEA/Swedwood to claim that they, as a Swedish company which profits by clear-cutting some of Fennoscandia's most important natural forest areas, are doing it partly because they want to supply the local population with wood. In contrast, IKEA/Swedwood do not show how much of the ancient trees from forests with high conservation values which, in addition to be used in their own furniture production, are sold to pulp mills to become paper, which largely are short-lived products. It wouldn’t look that “kind-hearted” in the media to make paper out of our most valuable natural forests. IKEA is the one who profits most by IKEA's actions, not the forest and the local population. If IKEA really wanted to make a difference in Karelia, they could preserve the old-growth forests, support local subsistence and local eco-tourism projects, and develop an environmentally sustainable forestry in secondary-growth forests which have already been logged in the past. Of course jobs and firewood are of central importance, but couldn't IKEA/Swedwood supply firewood from younger secondary-growth forests? Birchwood is excellent firewood, instead of using silver pines which are 300-900 years old. What is SPOK's position on this? Alexander Markovsky: Around the current lease of IKEA/Swedwood there are a lot of secondary forests, and they are not leased by anyone (http://forest-karelia.ru/uploads/f13.png). The Government of Karelia is very interested in the transfer of their lease. Use them - it is an opportunity to give work to local people, provide the communities with firewood and promote the recovery of economically accessible forests of northern Karelia. This task can only be managed by a large enterprise, such as IKEA, with government support from Karelian authorities. Forest management in secondary forests will help preserve the unique old-growth forests. PtF: IKEA/Swedwood is a major company which uses more wood than they can get from their own leased areas, so they buy wood from other companies in Karelia and Russia. Would you say that there is a risk of these companies logging forests with high conservation value and then selling it to IKEA? PtF: IKEA/Swedwood says that they do not use wood from intact natural forests, but isn't it true that they log forests which Finnish and Russian specialists in forest conservation have pointed out as intact tracts of natural forest with high conservation value? PtF: Isn't it the case that IKEA/Swedwood were logging a couple of years ago within the ”buffer zones” of a intact forest landscape and planned national park, and they only promised to stop doing this after criticism from SPOK? 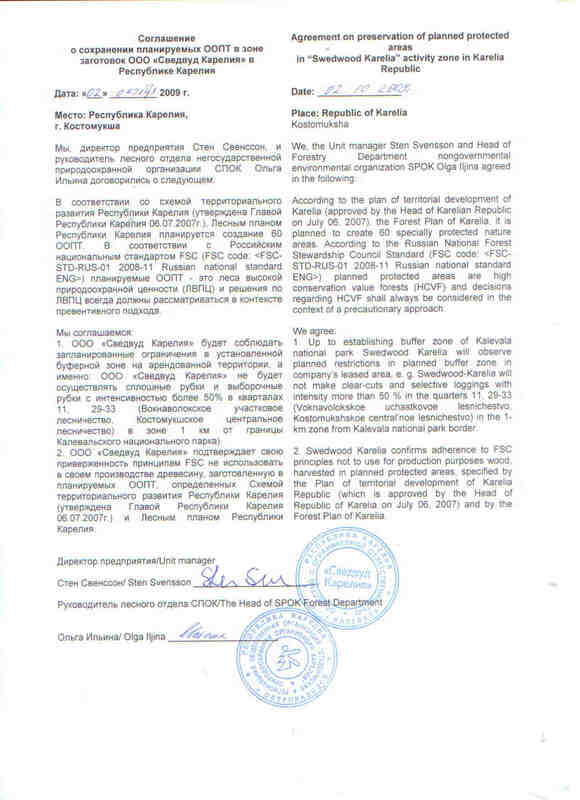 Alexander Markovsky: In 2009, after criticism by the SPOK, IKEA/Swedwood signed an agreement on the conservation and use of the proposed buffer zone around Kalevala National Park (http://spok-karelia.ru/wp-content/uploads/2009/10/2009_10_02_Protokol_Swedwood.jpg). The agreement specifies restrictions on logging in the buffer zone. PtF: IKEA/Swedwood says that they work with Russian stakeholders, and according to them, it is the opinion of these stakeholders which is given the most weight. To the worried customers who have sent in letters of protest, IKEA says: "It is our firm opinion that the interested parties in Russia should have the most say over the management of Russian forest." (Anders Hildeman, forestry manager of IKEA). Protect the Forest finds it absolutely essential, and indeed a basic requirement, that IKEA/Swedwood has a dialogue with interested parties in Russia about Russian forest! But they shouldn't be able to hide behind inadequate Russian laws, the flawed environmental certification FSC, and organizations such as the WWF which are sponsored with large sums of IKEA money. The fate of Karelian forests affects not only the local population, and there is already foreign involvement in the form of a Swedish company which profits by logging these forests. Customers of IKEA also have a right to know what is going on, since they might not want to contribute to the impoverishment of ancient forest ecosystems. Protect the Forest finds it arrogant of IKEA to tell worried customers and others who want to protect the last old-growth forests in Europe that it is only the interested parties in Russia who have a right to an opinion. We would like to ask SPOK: what is your response to people in other countries who care about the conservation of your forests? Alexander Markovsky: It seems to me that this situation has two sides. The first - a matter of saving the remnants of old-growth northern boreal forest (in Karelia). The second is that IKEA is lying in Sweden, so there is a need to meet with concerned citizens of Sweden to openly discuss the forests outside of Sweden. It is very important that people from different countries try to deal together with the difficult geopolitical questions. PtF: In light of how difficult it is to change the sluggish Russian rules for nature conservation, it is true that some of IKEA/Swedwood's actions have gained the approval of Russian nature conservationists. They have become better at dialogue with conservationists, even if they still fall short. Some of the forests which you have pointed out as having high conservation value have in fact been set aside by IKEA/Swedwood, and they have been praised for this. But on the other hand, it isn't difficult to be ”better” than the competition in Russia, because there are so many companies who wreak havoc on the forest. Because of IKEA's size, it is easier for them to appear as environmentally friendly. But because of that very size and their political influence, we should be able to demand more from them, not least that they stop chopping down our natural heritage. We know that SPOK and other organizations have, for pragmatic and strategic reasons, begun by working to protect the largest areas of intact natural forest, often with significant success. This is the way Swedish conservationists worked in the 1980's-1990's with the forests along the Scandes mountain range. Now Russian conservationists are surveying the more fragmented parts of Karelia to identify intact forest tracts and small natural forest areas which are important to preserve biodiversity on a regional level. In Sweden, nature conservationists have been accused of always wanting more, even though it is the forest companies who want more and more after having already converted most of the forest landscape to managed forest. Conservationists in Sweden today demand that all intact forests and all natural forest along the Scandes mountains should be protected, and that 20% of productive forests should be safeguarded from logging. The reason is that today we have more knowledge of the importance of the natural forest to sequester carbon and to sustain a functioning ecosystem, and more knowledge of how much we need to set aside to preserve biodiversity. We have been able to study the effects of fragmentation and the loss of natural forest on biodiversity, and so scientists have a better idea of how much we need to protect than they did 20 years ago. Is there any progress in Karelia when it comes to the forestry companies and the government and their understanding of the importance of protecting all remaining forests with high conservation value which you have identified? Alexander Markovsky: It seems to me that progress in understanding the importance of preserving old-growth forests are not great, but there is some. Today in Karelia, the companies voluntarily preserve about 0.2 million hectares (about 1% of the territory of Karelia). 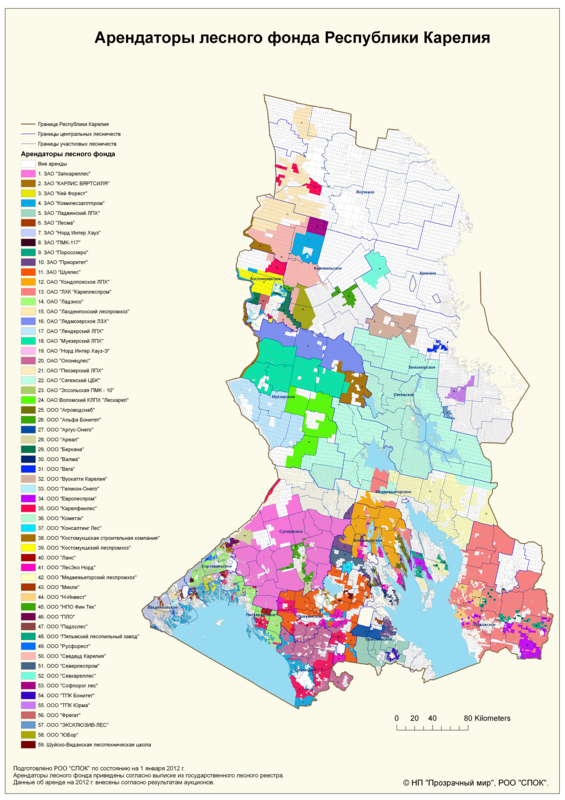 So in 2012 an updated master plan for the creation of new protected areas increased the amount of protected areas to 15% of the territory of Karelia in 2030. What would you suggest that IKEA should do to improve their forestry in Karelia? IKEA/Swedwood should manage a common open meeting with Protect the Forest, Friends of the Earth Sweden, SPOK and maybe also other organisations to discuss their modern forestry practices concerning cutting OGF. IKEA/Swedwood should in nearest 3-6 months finish their identification of HCFV in their leased area and manage discussion with main stakeholders (Protect the Forest, Friends of the Earth Sweden, SPOK) and Karelian government on how they will protect it. IKEA/Swedwood should publically announce that they will not cut or buy the wood from identified OGF, HCVF and planned protected areas in Karelia and all of Russia. IKEA/Swedwood should spend their time and power to move their forestry from old-growth forests into secondary forest (in Karelia and in all Russia). During 2012 they should start to do such forestry in secondary forest areas, based on agreements with the Karelian and Russian Government. PtF: Could you list positive and negative aspects of IKEA's involvement in Karelia? Positive: Now in the north of Karelia Swedwood is the last operating company, while other companies have gone bankrupt. They give jobs for some people. They try to protect HCVF and woodland key habitats. Negative: Swedwood cuts HCVF and and does not want to do forest management in secondary forests in north Karelia. Swedwoods contribution to the local economy and social life is very limited. PtF: Last question. Do you think the list (made by Protect the Forest, Sweden) of demands that we have sent to IKEA/Swedwood is reasonable? Alexander Markovsky: Yes, in the basic underlying ideas.